Budgie (Parakeet) Personality, Food & Care – Pet Birds by Lafeber Co. The budgie (parakeet) is often thought of as a “beginner bird,” however, this social, outgoing little bird deserves just as much care and attention as larger parrots. Budgies are playful, love food and they can rival any parrot in terms of talking ability. Budgies can amass large vocabularies. A budgie’s voice sounds like a sped up recording, so an owner might not even recognize that their budgie is talking! The budgie, or budgerigar, is most commonly referred to as the more generic term “parakeet” in the United States. The wild budgie is similar to the birds we see today in pet shops, though smaller (between 6 and 7 inches long), and only found in the nominate color, green. Its Latin name means, roughly, “song bird with wavy lines,” which is a pretty good description of this popular bird. Naturalist John Gould and his brother-in-law, Charles Coxen, brought Budgies to Europe around 1838. Europeans became charmed with the birds, which bred readily, making them a staple pet in wealthy homes. The Budgie was displayed at the Antwerp Zoo in Belgium around 1850, and began to gain in popularity, not only with the wealthy. Australia banned exportation of Budgies in 1894, and the Europeans had to breed their existing stock in order to continue the hobby. The budgie found its way to America in the late 1920s, but didn’t experience real popularity until the 1950s. Today, it’s the most popularbird in the world. The budgie is native to Australia, where it still dominates the grasslands in large, undulating flocks. The wild budgie is similar to the birds we see today in pet shops, though smaller, and only found in the nominate color, green. The nomadic wild parakeet is found in large flocks that are always on the search for water, which is limited in the scrublands, the habitat that makes up much of the budgie’s natural range. They breed in the rainy season when water and food are plentiful, and nest in hollowed out trees or tree limbs. They can be pesky to farmers, and are especially dangerous to grain crops. Budgies can live between 7 to 15 years, though the average is far less than seven due to mistreatment, accidents, or lack of knowledge about appropriate bird care. It seems that this little bird is often seen as a “throw away” pet because it’s inexpensive. Budgies are also prone to obesity, fatty tumors and liver, foot disorders, scaly face, and intestinal parasites, all of which require veterinary care. Most budgies are ground-feeders that eat primarily seeds and plant material. Lafeber foods are a simple and healthy way to feed your parakeet properly. Our research has shown that little birds get “hooked” on seeds easily. Many of our foods incorporate seeds with healthy pellets, fruits and vegetables, as well as Omega 3 and 6 fatty acids and chelated minerals. 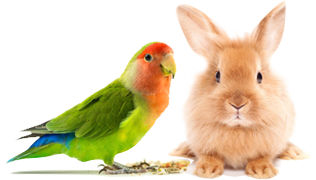 Try Avi-Cakes, Lafeber’s Premium Daily Diet Pellets, Popcorn Nutri-Berries, and Nutri-Berries. The budgie is often underestimated as a hands-on pet. It is certainly good as a “watching only” pet, especially if kept in pairs or in a colony, but it’s easily hand tamed and can become a loyal, loving little friend to a patient owner. Budgies are social birds and won’t do well in a life of isolation. Budgies housed together do remain friendly if given enough contact, though a lone parakeet is often the best choice if you want a “pet-quality” bird. Parakeets are okay with children if the children are respectful of them. This small bird can easily become victim to a raucous child. Adult supervision with any pet is advisable. This bird’s beak isn’t as powerful as some of the other birds of its size, but it can certainly hurt little sensitive fingers. The budgie is the best talking bird among the parrots, able to learn words, phrases, and whistles easily. One budgie has been recorded repeating more than 1,700 words! The males are the best talkers, though females can learn a few words and can also whistle well. Budiges are prone to tumors, goiters (due to iodine deficiency) and other conditions related to an all-seed diet, psittacosis as well as scaly face/leg mites (which presents as a scabs around the nare and eyes and/or legs). Budgies occur in a large assortment of colors and patterns, over 70 mutations to date, with more developed each year. The fancier mutations are available through hobby breeders, though most people are happy with the standard green, blue, yellow, and white. Budgies are sexually dimorphic, so it’s easy determine the difference between the genders at about six to eight months of age, when they mature. The adult male’s cere (the flesh above the beak) is generally blue, while the hen’s is pink or brown. Young birds can’t be sexed in this way — an educated guess is your only chance of buying a young pair. The English show budgie is also a popular pet, and though it’s only 8 1/2 to 9 1/2 inches long, not that much longer than the American parakeet, it looks nearly twice the size. The temperament of the two birds is quite similar, though the English may be more docile. Both make equally good pets. The English budgie has about half the lifespan of the American parakeet because they are often inbred.